Utilizing straps, this exercise allows complete focus on the upper abdominals. 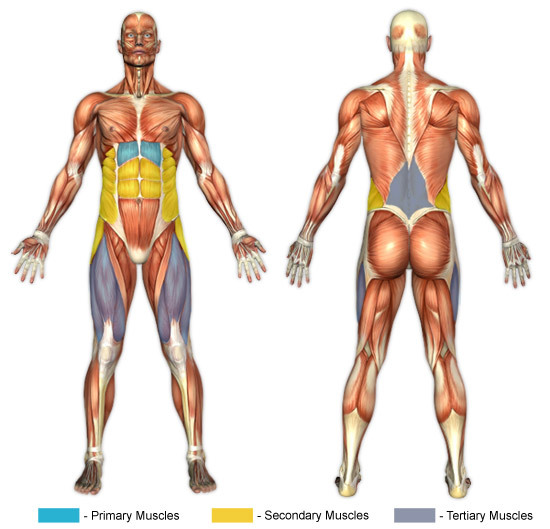 When the lift reaches a certain point, the spinal erectors also become involved. Keep the straps parallel to the ground, slowly bring the knees to the chest, rounding the back to achieve optimal abdominal recruitment, and exhale throughout the movement. Slowly bring the knees back down to the starting position, inhaling throughout the movement. It is easy to get into a swinging motion with this exercise but imperative that control is maintained throughout. Do not grip the straps more than necessary to remain secure, as this may recruit the arms in part of the lifting motion. Allowing the knees to bend and go behind the body lends itself to swinging motions. Keep the feet in front of the body.